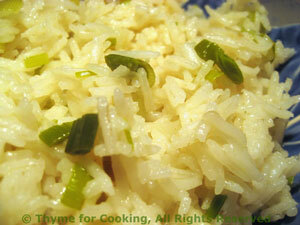 Basmati or Brown) Rice with Green Garlic, Thyme for Cooking easy side dish. The mild taste of green garlic adds a spring freshness to simple Basmati rice. Use as much of the green tops as you can. Trim and slice green garlic / onion and garlic. Melt butter in a small saucepan over medium heat. Add green garlic / onion and garlic, sauté briefly, 1 - 2 minutes. Add rice and sauté, stirring for 1 - 2 minutes. Add stock, cover and cook for length of time on package. When done fluff with a fork and serve.